Welcome back to the second installment of my What I Eat In A Day series, where I chronicle literally everything I eat on a particular day. I know it sounds weird, but I honestly love reading posts and watching videos like this to give me 'food-spiration' and ideas for my own meals. 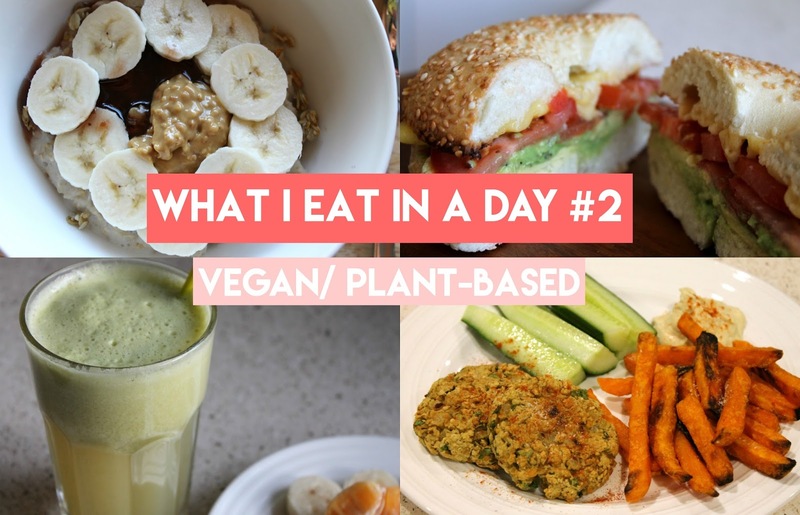 As you may remember from my last WIEIAD post, I have turned to a Vegan, Plant-Based diet and couldn't be loving it more! If you would like to see a post about my thoughts and the process behind the 'sudden' change, please let me know and I will do just that! Kicking off the day with a bowl of steaming porridge, I topped mine with banana slices and a swirl of Peanut Butter and Strawberry Jam. Yes, you read that right, PB&J oats! Honestly, if you haven't tried it you are missing out big time! I have recently gotten back into juicing so I accompanied my breakfast with a juice of orange, apple, celery, carrot, lemon and ginger. The perfect zing to get the insides moving for the day. On this particular day I was super pressed for time trying to write some assignments for uni, so lunch had to be quick and easy. I took out this bagel from the freezer after breakfast and by lunch time it had thawed completely. I made my standard avocado and tomato duo and added a slice of vegan Bio Cheese (Holy crap, try this cheese if you're vegan or lactose intolerant!). I would have liked to pack my bagel with some spinach too but alas, I had used it all up! By around 4pm, I had felt like another juice and paired this with a snack (which I didn't end up eating because I wasn't hungry). I love making a green juice in the afternoon, it just feels so cleansing and detoxifying. This one consisted of pear, lemon, cucumber, celery and apple. I was honestly so stuck with what to cook for dinner, all I knew is that I had leftover chickpeas from a can I had opened the previous day that needed to be used. So I turned to the internet for inspiration and found this amazing Falafel Recipe which I amended slightly (I added breadcrumbs instead of quinoa and baked them in the oven) and served with a side of hummus, cucumber and crispy (!) sweet potato fries. Delicious! Please let me know if you are enjoying these WIEIAD posts and if you would like to see more on my blog. Also, if you have any questions about veganism, please leave them in the comments down below and I will reply to them ASAP! Your morning porridge and juices look SO delicious! Take care doll! Oh, I'm hosting a giveaway, I'd love if you entered! I love your breakfast, I eat porridge in the morning too, but I add some coco in mine :) It all looks delicious and I hope you continue doing these posts. Ooh, cocoa is so nice in porridge, I'll have to remember to try that again soon! Wow your menu is so good and healthy. I will try to repeat this. Thanks Yukova, I'm so glad you enjoyed it! That bagel looks so darn good! I actually love soy cheese, my husband's aunt is lactose intolerant so she introduced it to us and I'm hooked! I love falafel, i really should try making it myself rather than relying on my house mates aha! Haha Dana! It's always nice when someone else cooks for you but I think it's equally as satisfying when you make it yourself! I'm always interested in seeing what other people eat - though sure, mainly because I love looking at photos of food haha ;) Seriously though, your breakfast looks so tasty - aaand now I'm craving banana! Haha I'm totally with you on that Gabrielle, I love a bit of food-spiration!